Top Gun Treks Alaska hunting guides are based in Wasilla, Alaska. It’s a family run Alaska business, owned and operated by lifetime Alaska resident registered guide, Bob Jewett. All Top Gun Treks Alaska guided hunts are fair chase hunts conducted in wilderness locations accessed by airplane. We have one of the most productive moose hunting areas in Alaska. Our hunters have experienced a 90% success rate over the last ten years. We generally see multiple legal bulls and have many close encounters with moose during the pre-rut and rutting season. Top Gun Treks offers many different options for your Alaska bear hunting adventure. We have guided and unguided hunts for black bears and fully guided hunts for the prized Alaskan brown bear. 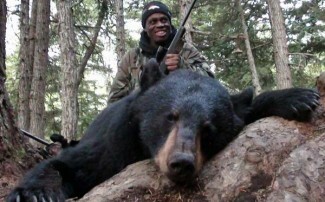 We conduct hunts in both spring and fall bear hunting seasons. Our guide areas have excellent sheep populations which means our hunters often get to see many sheep during the hunt. In our area it’s possible to see sheep, moose, and bears in the same field of view so many of our hunters choose our combo hunt option. Top Gun Treks is a family owned and operated business located in Wasilla, Alaska. 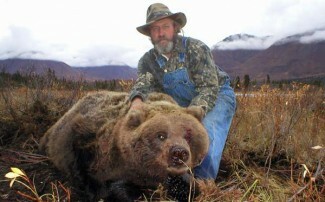 Our Alaska hunting guides specialize in providing quality big game hunts in Alaska. Our territory includes thousands of square miles of Alaska in units 14,16 and 20 which host large healthy populations of game of trophy quality. Our guests have had great success hunting with us and have taken many species of big game while on our hunts. Guests should plan to fly into Ted Stephens International Airport in Anchorage or Fairbanks International Airport depending on the hunt location. Some of our hunts will require an additional air charter to get to base camp. We will assist you in arranging the proper flights for the specific hunt you are booking. Once your at our base camp, our prices include all transportation to and from spike camp as well as ferrying all game meat and trophies out of the field. We are not responsible for weather related delays getting you to and from camp. We will always do our best to fly on scheduled days weather permitting. Bob Jewett, registered Alaska hunting guide, bush pilot, and taxidermist, has been hunting and guiding in Alaska’s wild back country for over 40 years. He started hunting in Alaska as a young boy and since then has hunted nearly every part of the state. 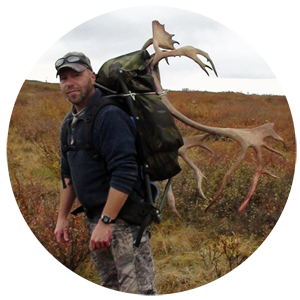 His years of experience and local knowledge coupled with his prime hunting areas in non-motorized areas of Alaska wilderness, give you confidence of success. Bob only schedules a limited number of hunters into his camps every year to assure quality hunts for his clients. HUNT PRIVATE LAND – We now have exclusive guiding rights on 41,000 acres of private land just 30 minutes flight from Anchorage. 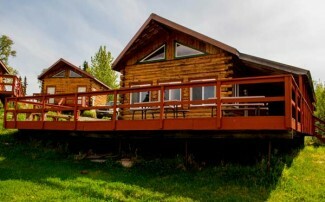 Stay in a nice lodge with hot showers, great food, sauna, and enjoy the option to hunt 10 different active bait stations. These guided black bear and brown bear baited hunts are very affordable and we have LOTS of bears hitting the bait sites virtually all day long. This is a one of a kind guided bear bait hunt.